We all know Rupert Murdoch runs the Liberal Party. Can we all agree it is time he stopped running the country too? No matter who wins the ultimate cage fight victory, we all know who the real leader of the Liberal Party is. Whether Turnbull prevails to limp wet-lettuce-leaf-like to defeat at the next election, whether ScoMo blusters and lectures his way into high office, or whether the potato-man leaps triumphant from the boiling pot without being skinned, we know none of them hold any authority. No, the real leader all along is Rupert Murdoch. Always was. Don’t believe me? Watch this rant by Chris Uhlmann who is being called brave by many other senior journalists who never had the guts to say the same. In a nutshell, Uhlmann has admitted that media commentators and journalists have become players in the political process, making themselves part of the story, and changing political outcomes because of it. Uhlmann seemed fed up that powerful right-wing commentators have been helping Dutton to spill Turnbull’s job, suggesting that the game has gone too far. This reminds me of when I was a child. My sisters and I would be skylarking around, and my mother would say: this is going to end in tears. Uhlmann is crying because he doesn’t like the way Dutton’s media supporters are behaving, but that’s not to say Uhlmann isn’t a player too. He knows the game well. How else do you think he’s got where he is? It’s lucky I don’t mind saying – I told you so – because I did tell you so. I’ve been talking about the disastrous impact of media ‘playing’ in the political arena for as long as I’ve been blogging. All the while, I’ve been criticised by the very few journalists who engage with me, for being a conspiracy theorist, for being ‘a broken’, for not knowing what I’m talking about. There’s this idealism amongst media players about their role in society. They see themselves as the ‘Fourth Estate’, as watchdogs on democracy, holding the government and the opposition to account, all in the name of the public interest. We’ve been told that this leads them to be pure, objective observers of reality, and that they provide fair and balanced coverage of all things political, in order to help voters decide which leaders are worthy of our votes. This idealism tends to result in some fairly arrogant attitudes amongst journalists, such as believing they know better than the public, that they can see political events more clearly than us, and that they are un-biased in their analysis of news, unlike us ‘cheerleaders’ who take a side and can therefore not be trusted to have credible views on anything. The clash between folk like me, who question whether journalists should be reporting leaked information from, say, disgruntled staffers in a Labor MPs office, when there is clearly a political motivation behind the leak, and the journalists who constantly claim everything is above board and there’s nothing to see here, move along, has become more and more toxic in recent weeks. I’ve been blocked by many senior political journalists for complaining they are inserting themselves into political games rather than being the objective and fair custodians of truth that they claim to be. I’ve complained that they, intentionally or not, bias their reporting towards ready-made narratives, without hearing, or seeking alternative explanations. I’ve complained that balance doesn’t mean ‘he said, she said’, it means investigating both sides of a story and giving the reader a fair assessment of the credibility of both claims. If one side says it’s raining, and the other says it’s not, it’s the job of a journalists to look out the window and tell us which is correct. I know it’s not always as easy as that, but at the very least, journalists could try. I know there are good journalists out there, but there are also terrible journalists out there. Lot’s of them. Let’s get this straight. You are not a watchdog on democracy when you are a player in the political process. This whole situation has been made worse by the number of media players who have stepped straight out of political roles, and into the news media. There are media players who gleefully talk of vendetta journalism, like it’s totally normal that a journalist would campaign against political opponents (I’m looking at you Sharri Markson). Sharri, incidentally, doesn’t appreciate Uhlmann’s comments, what a huge surprise, and claims she can single-handily assure the public that News Corp has had nothing to do with Dutton’s campaign, because apparently she knows everything that is going on in that entire organisation, and the Daily Telegraph are pure news reporters who don’t play political games, and also there are fairies living in my bathroom cabinet. The point is, the cat is now out of the bag, and we all knew it was there all along. So what? You don’t need to be writing a PhD thesis on this stuff, which I currently am, to understand why it’s dangerous for media players to be so tangled, twisted, intertwined and meddling in the political process. These people claim to be speaking the truth to power, when really they’re distorting the only version of political reality the voters can realistically access, using the voice of the powerful. This means that powerful people, like Rupert Murdoch, can, on a whim, decide to change the Prime Minister of Australia, and his media-playing-employees go about making that happen. It’s the stuff of dictatorships. It’s the stuff of corrupt, fascist, bullying regimes where the public are misinformed in order to control them. This is not small fry. 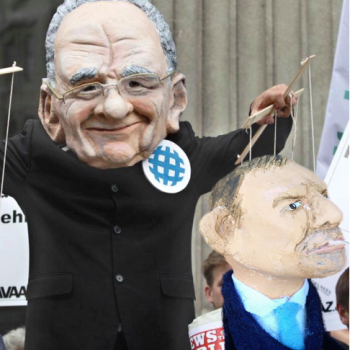 This is our country, and Rupert Murdoch is pulling the strings. I’ll finish on this. Jacinda Ardern, the young, optimistic, proactive, kind, authoritative and competent Prime Minister of New Zealand is paving a truly impressive progressive agenda for her country, and she is doing so with popular support from the public. New Zealand doesn’t have any Murdoch media. Enough said. Emperor Rupert has held inordinate political power since he supported Gough Whitlam against PM Billy1972. Then, it appears Rupert was miffed when Whitlam did not appoint him to a highly desired post. This century the Labor Party needed to have impeccable leadership and campaigns even when the LNP is divided, incompetent, and corruption-prone with relatively unpopular policies. Let’s be clear that Rupert’s disastrous level of power in Australia was actually escalated into a catastrophic level by Paul Keating with his unwise retaliation against the Sydney Morning Herald which had run damaging articles about Keating’s involvement with a profitable piggery company. Let’s also be clear that Chris Uhlman’s own failure to provide objective and fact-based analyes is lamentable. Yes, SkyNews evening programs are heavily weighted toward conservative opinion commentators, but this is not the case with their news delivery in the daytime, whereas Uhlman’s NINE News mixes his unsupported opinions into news bulletins just as Seven and TEN news do. Particularly egregious is the ABC 24 Hour News penchant for having one ABC journalist interview another ABC journalist. Similar widespread journalistic failures by America’s MSM made them sitting ducks when Trump started starting attacking them as Fake News. Indubitably, Murdoch’s empire is the most unfair and unbalanced of Australia’s MSM, but the utter tragedy is that there’s currently no Kerry O’Brien or even Laurie Oaks to provide a bedrock of sound analysis and interviewing. The entire Canberra Press Gallery disgracefully spent the first half of winter stoking an absurd fictional leadership challenge to Shorten because “Albanese gave a speech” while ignoring the obvious policy/personally conflicts in the Liberal Party that have inevitably resulted in the leadership crisis paralysing the government this week. Poor fellow, out country.